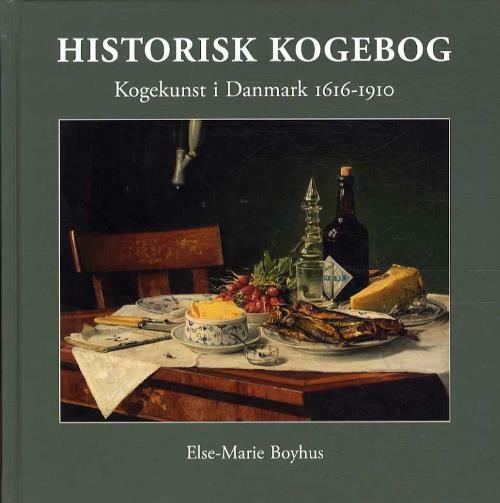 If you have any interest in Danish food history between 1600 and 1900, then this is a must read! The book is both a book about food history and it is a cookbook in the sense that it is full of recipes from historic Danish cookbooks. I have already tried to cook already tried a few of the recipes and her translations are easy to work from. There is a huge number of illustrations that makes it book wonderful to look at and inviting. All of the illustrations are from the period they are accompanying. The book is thorough and very readable. It is filled with small and large fact about food, cooking and everyday life in the period. The language is a bit old-fashioned but it is very readable and doesn’t distract from the reading. Some of the book feels like it was just written after a week spend reading old cookbooks. Historisk Kogebog is extremely well researched. I got the impression that Boyhus has tried to make many of the recipes herself, as the book is filled with practical instructions on how to try to recreate the dishes today. The book is divided into two large part: The era of the hearth and the era of the wood stove. In each era Boyhus tells us about ingredients groups, about how they were used and then she goes on to track common recipes. Often we get 3-4 recipes for the same dish from different cookbooks and periods. It’s very thorough but also really interesting to see the cooking techniques and available ingredients change and the dishes with them. The Danish kitchen has been influenced by German, English, French and Italian food traditions – depending on the period. The book tracks both the cooking of the nobility, the bourgeoisie and the common people in the country side. I have writen number of blog posts based on her book and I want to own the book. The book has also made me track down books on more subjects in food history. Edit: My mom brought me this book for Christmas last year and it has been of the shelf and in use quite a bit over the last year.